Sometimes a building finds itself the source of much community affection and attachment, and at the same time these are the buildings that by their nature often help to define a suburb. 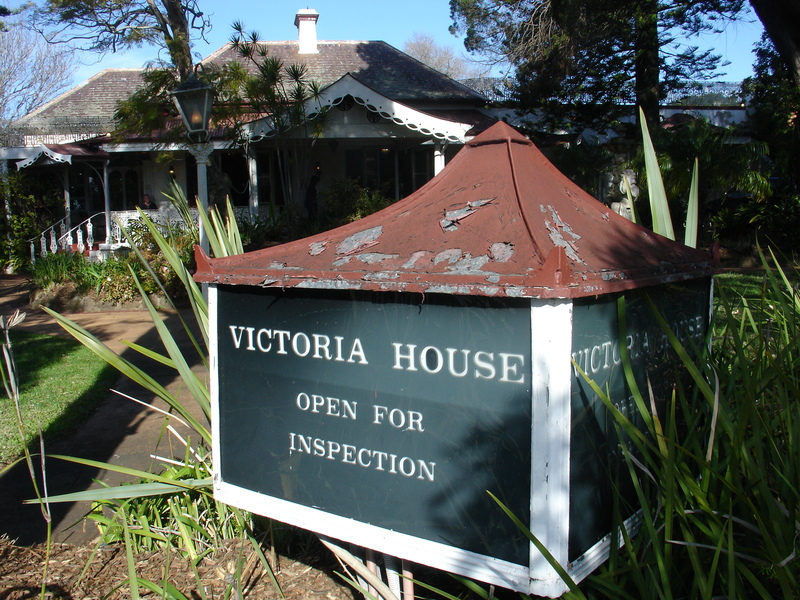 One such example is Victoria House in Bexley, an old 1855 mansion that served as a wedding function centre for 65 years until its closure in late 2014, by which time it had earned the enviable status of being the longest serving reception house in Australia. On the weekend of 25-26th July the old girl threw open her doors one last time, not as a reception centre, but as an auction house, for the purpose of clearing out virtually everything that had come to adorn the graceful building both inside and out over the course of its meaningful life as entertainment venue come antiques museum. The walls were filled with Australian art, the floors with English Oak furniture holding up Oriental porcelain and Russian Religious icons atop Persian rugs, and the ceilings hung with dazzling crystal chandeliers, one of which belonged to none other than Dame Nellie Melba in her Dandenong Ranges property. Outside the circular gravel entranceway was studded with Mercs and Jaguars all for sale, even the garden furniture and concrete planters were tagged, and of course, leftover cases of Pinot and catering equipment galore in the vast kitchen which has obviously seen its last crème brûlée come out on a silver trolley to the hordes of welcoming guests. But the star of the show was the old girl herself, Victoria House. Constructed by John MacLeod, a master builder from the heydey of the colony who completed such famous structures as Town Hall and Fort Denison, as well as parts of the QVB, it was a wedding present for his son Hector, a renowned builder himself who sadly died at the age of 31 as a result of a work site accident. In the early forties the house was transformed into a reception centre and run by the same family for many decades, and now, Richard White, grandson of those original managers wants to convert the structure back into a private residence once more, resurrecting the old house name of Cluny Brae. Having grown up nearby and passed by the estate many times but never really knowing what went on inside, I saw it as an open invitation to wander around and take it all in. Up through the time-tarnished Victorian porch and into a formal landing, two vast open spaces, the Edward Room and the Colonial Room sprawl out on either side separated from each other by the cavernous catering kitchen. The Edward Room is the original grand ballroom, with sprung dance floor, intricate curved ceiling reminiscent of a church nave propped up by slender Roman columns, leading to a beautiful stained glass window behind the stage. The Colonial Room was converted in the 1960s from an original billiards room, with its magnificent wood paneled bar and great feeling of pompousness embellished with fine period furnishings. Between the two rooms simultaneous gatherings could be catered for half an hour apart. If only these walls could talk… They would surely speak something of the endless nights of heartfelt celebration, of blushing brides, gushing parents and boozy heads… It is easy to see that Victoria House is still revered, many of the people filing through spoke fondly of having their wedding receptions take place within its walls decades ago. I even overheard two young girls talking of when they worked here, not so long ago, and chatted to a former MC of the house who was taking one final look. I turned and said how sad I thought it was that all this was coming to an end. “Not really”, he replied, “all good things have to come to an end…” and I reflected on it later – that wasn’t a throwaway comment, he was absolutely right. All good things do come to an end, and perhaps that is where we should leave them, rather than pine after them in some dimly lit memory for years and years to come. For so many people this grand old building held a special place, and over this weekend in July 2015, she still knew how to turn it all on one last time. Just up the road from Victoria House, the Federation masterpiece known as Brandlesome, at No.580 Forest Rd. has recently traded hands after being neglected and unoccupied for many, many years. We hope the building’s heritage status will ensure it remains an asset to the area for generations to come (although knowing Rockdale council it may be surrounded by townhouses by the end of the year). And down the road, another local icon has closed its doors for the very last time. Bexley Jewellers has ceased trading after 46 years. I remember this shop as a child and recently went in to find smiling owners Mona and Raymond Awad still tending the business of jewellery and watch repairs as they had done for decades. This really was an old school suburban jewellery store in the finest sense of the word. Mona and Ray will be missed. Brandlesome photos Ray White, all other photos Inheritance 2015.